Businesses today prefer Instagram for several reasons. A visual platform to showcase products, Instagram is also a vastly popular social channel. For small businesses, it is therefore the perfect place to reach customers. But how can you use it to grow your business? U.K. based social media image printing company Inkifi has compiled all the information you may need to leverage this growing channel and offers eight tips for growing your small business using Instagram. Here are four. By linking your Instagram account with your other social media accounts, you can post across multiple platforms at the same time. It’s also a good idea to have a good website in place before setting up your Instagram account. Instagram has introduced several features to help businesses promote their products. Using Hashtags, for example, businesses can improve their visibility on Instagram. Instagram is also moving towards video content with its live video streaming feature, which can benefit businesses. Much like Snapchat, Instagram Stories allows users to post multiple pictures and videos that disappear after 24 hours. 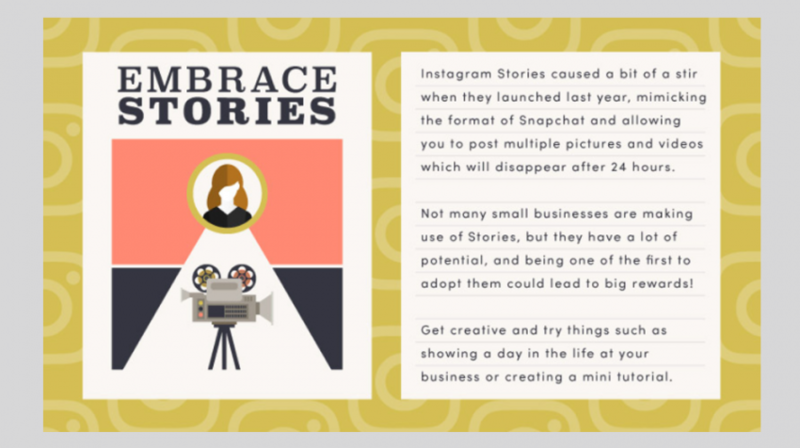 Although most businesses are not using it today, Instagram Stories can boost a brand’s exposure. With some creativity, small businesses can find newer ways to promote themselves using this feature. As with any other social media channel, it is important to constantly monitor your activities on Instagram. By doing so, you can see how your audience is responding to your activities and tweak your messages accordingly. When you analyze your activities, make sure you see which posts and hashtags are working for you. This will help you understand the type of content your audience wants to see more.